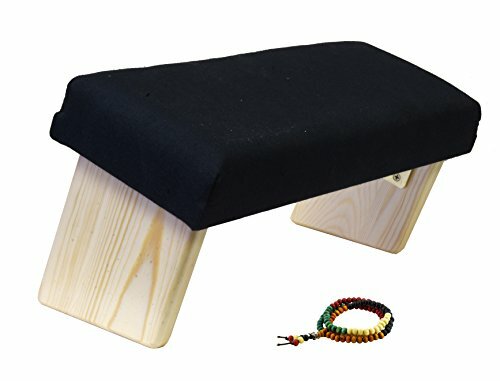 This foldable but secure meditation bench with a minimalist touch provides steady and firm support and will help you concentrate by taking pressure away from your ankles, hips, legs, and joints in kneeling. It is also great for praying and seiza practices. The following features set our benches apart. This relaxing bench is a wonderful alternative to a meditation cushion, zafu, zambuton, or chair. It is beautifully constructed with a perfect fit and finish. It is sustainable and well crafted with care and love. It is not only aesthetically pleasing in its simplicity, but also delightful to use. It can be easily folded to store away or tuck it in a suitcase or a car trunk for a meditation, zazen, or yoga workshop, class, or retreat. Whether you practice Vipassana meditation or are doing hero or lotus cross-legged pose, it will help you maintain your posture, stay focused, and relax. By tucking your legs underneath it and sitting upright, it will prevent fatigue and leg numbing, ease back or neck pain, remove strain, and allow you to enter very deep meditative states without shifting positions. For those who have hip, ankle, or knee problems, or are not very flexible, this bench will offer an effortless sitting experience in kneeling. This stylish bench is also a great conversation starter. If you have any questions about this product by Mudra Crafts, contact us by completing and submitting the form below. If you are looking for a specif part number, please include it with your message.